My tiny hero does not fly. My tiny hero does not wear a cape. My tiny hero does not have a disguised name. My tiny hero does not fight crimes. My tiny hero does not have enemies. My tiny hero does not have super powers. I met this tiny hero of mine through her kicks and punches. She was in my mom’s belly. Every night I read to her and kissed her goodnight. A month ago, I finally met this tiny hero of mine. She came into this world and became my sunshine. Her smiles make me smile. Her coos make me happy. My tiny hero brings joy. My tiny hero wears mittens. My tiny hero has a real name. My tiny hero battles germs. My tiny hero has lots of doctors. Swoosh-oosh-oosh, not like your and mine. My tiny hero will be strong in her surgery. My tiny hero’s heart will heal. I love my tiny hero. 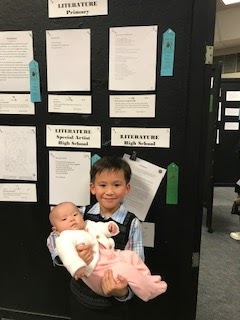 Calvin Nguyen, a second grader at Lake Forest Park Elementary, is a first place winner in his age group for the State PTA Reflections contest. The theme was Heros.